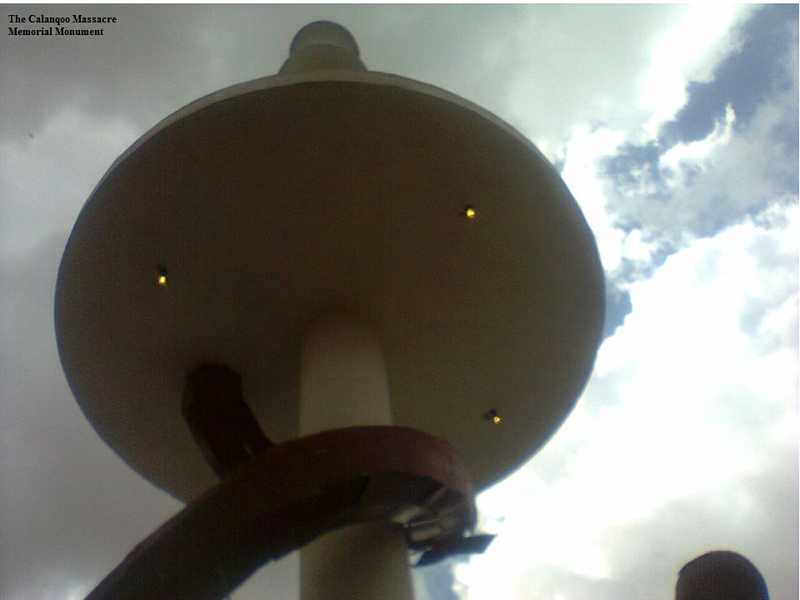 Posted by OromianEconomist in Aannolee and Calanqo, Aannolee Oromo Martyrs’ Memorial Monument, Hetosa. 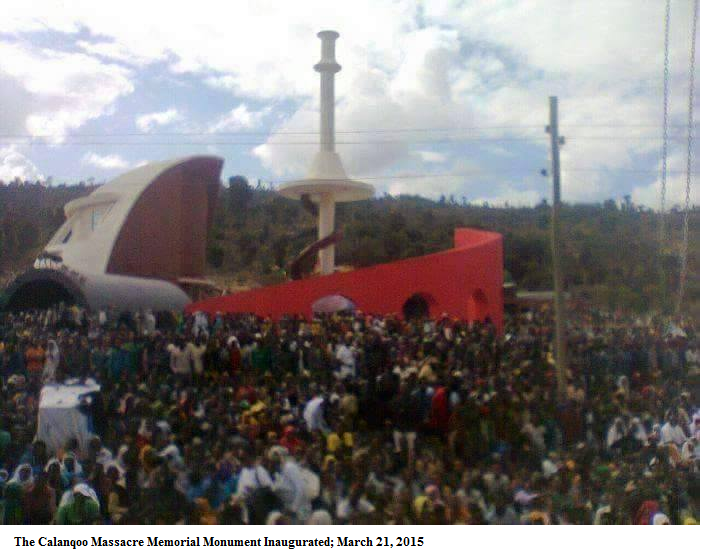 Posted by OromianEconomist in Aannolee and Calanqo, Aannolee Oromo Martyrs’ Memorial Monument, Calanqoo Martyrs' Memorial Monument. The Calanqoo Massacre Memorial Monument Inaugurated on March 21, 2015. 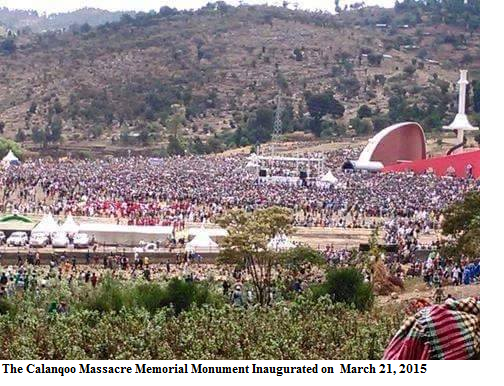 The Calanqoo Massacre Memorial Monument was inaugurated on March 21, 2015, in the presence of thousands of attendants. 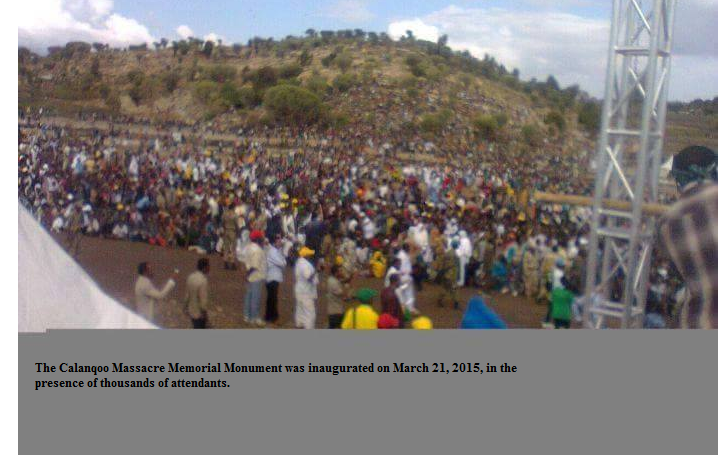 The Calanqoo Massacre was perpetrated on the Oromo people and other neighboring peoples on January 6, 1887. During this day-long atrocious killing of thousands of innocent Oromos and others, King Menelik of Abyssinia was himself presented as a leader of his Neftegna army. Quuqaa garaa keetii naatu sirraa buqqisa. Oromootaaf himi seenaa gaafa kaanii. Nuu himi gaa seenaa kaleessaa. Posted by OromianEconomist in Aannolee and Calanqo, Africa, Aid to Africa, Colonizing Structure, Corruption, Development, Dictatorship, Economics: Development Theory and Policy applications, Environment, Ethnic Cleansing, ICC, Janjaweed Style Liyu Police of Ethiopia, Land Grabs in Africa, Nubia, Oromia, Oromiyaa, Oromo, Oromo Culture, Oromo First, Oromo Identity, Oromo Nation, Oromo Social System, Oromo the Largest Nation of Africa. Human Rights violations and Genocide against the Oromo people in Ethiopia, Oromummaa, Self determination, Slavery, Tyranny, Uncategorized. The marks of Aannolee, Azulee, and Chalanqoo/Calanqoo cannot be erased from the memory of Oromo generations The marks of Aannolee, Azulee, and Chalanqoo/Calanqoo cannot be erased from the memory of Oromo generations. The marks of Aannolee, Azulee, and Chalanqoo Cannot be erased from the memory of successive Oromo generations and from the history of the Oromo people. These marks are incorporated into our collective memory. For this, centuries may pass, generations may come and go but the crimes of Abyssinia-the mutilation of breasts of women and girls and of the right hands of men and boys at Aannolee and the mass massacres at Azulee and Chalanqoo will not be erased, will never be diminished, and never be forgotten. Menelik II’s mutilation of breasts of women and girls and of hands of men and boys is the first one in warfare throughout written history-from antiquity to modern times, unless proven to the contray. Those who support Menelik’s genocide at Aannolee, Azulee, and Calanqoo as a “holy war” or as a war of “reunification of Ethiopia” should hold full entitlement to it. Abyssinians always avoid public discourse of the genocide at Aannolee, Azulee, and Chalanqoo believing that sooner or later in the course of time that generation would pass from the scene and their children would become acculturated and assimilated in the Abyssinian way of life and Abyssinian political thought and then the issue of genocide dies out and will be forgotten. However, what the Abyssinians forgot or failed to understand is that the genocide at Aannolee, Azulee, and Chalanqoo shapes not only the outlook of the immediate victims of the generation of the time but also of subsequent generations of the future. It is very important for the descendents of the perpetrators- the deniers of Oromo genocide to engage introspection to face and learn from their own history. It is time for the Nafxanyaas-the deniers of genocide to ask themselves question as to how that gross mass genocide could have occurred, instead of denying it and trying to maintain a false righteous self-image. Today, the Tigrayan regime is behind the discussion of the past genocide to divert attention from itself, while it is committing genocide itself more dangerous than that of the past ones. It has undertaken open and total war campaign against the Oromo people. It is vitally important, therefore, that we should focus our attention on current genocide the Tigrayan regime is committing, while at the same time reminding ourselves the genocide that the Amhara regime of Menelik II committed a century ago. The Amharas have been denying the genocide against the Oromo and other southern peoples that their regime of Menelik II committed and now the Tigrayans are also denying the genocide that their regime is committing. The Amharas are simply dancing and singing to the ghost of Menelik II but they do not possess the means and capabilities to commit anther genocide. Today, it is the Tigrayan regime led by TPLF that is committing genocidal mass murder against the Oromo people; it is this regime that possesses the means and capabilities to commit genocide. Its means are the army, paramilitary unit, the police force, special police or Liyyuu police, secret state agents, Death Squads, the bureaucratic and judicial system. All of these are already fully utilized for this purpose. The sudden descend of the Tigrayan People’s Liberation Front (TPLF) upon Oromiyaa in 1991, set in a rapid motion a process to eliminate any opposition to its rule that culminate in the arrests, tortures and killings. Then since 1992, it has been carrying out a systematic, methodical, pre-planned, and centrally-organized genocidal mass murder against the Oromo people. Meles Zenawi was the notorious architect and organizer of policy of the Oromo genocide with his culprits and other thousands of perpetrators of genocide who are still implementing his policy after his death. His brutality against Oromo people has surpassed that of all his predecessors combined. His regime has erected concentration camps across Oromiyaa, camps such as Hursoo, Bilaattee, Dhidheessaa, Zuwaay, and Qalittii are the well known ones. But numerous other clandestine prison cells where the victims are eliminated have been established across the empire. 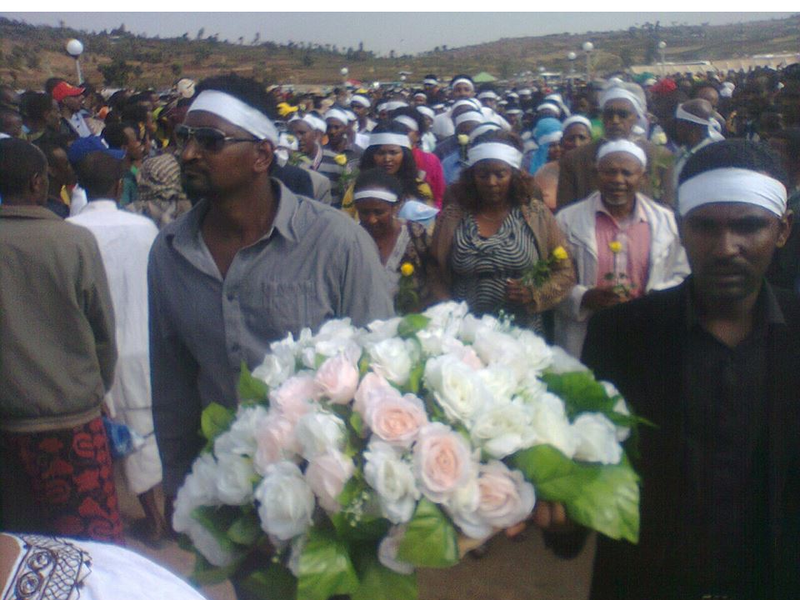 The regime has openly undertaken a major Oromiyaa-wide persecution of Oromo. Hence Ordinary people, for the first time, being rounded up and sent to these clandestine centers for interrogation through torture. In the torture, few survived and many perished. The pattern of destruction has been repeated over and over in different parts of Oromiyaa. Many of these repetitive destructions are far from the major cities; such repetition are a centrally design one. Further, reward structure set in place. That reward is geared towards those who implement the policy. The regional governors and officials who refuses to carry out orders to annihilate the Oromo are summarily replaced as disloyal and OLF agent. Community leaders are arrested and persecuted. Many of women, children, and elderly run into forests and deserts to escape slaughter. Today, the Oromo people are in violent historical moment. They are the target of Tigrayan regime for physical extermination and forcible removal from their lands. Hundreds of thousands have been killed; millions have been forced out from their lands and their lands haven been sold or leased to local and multination land-grabbers. The Tigrayan regime has fully undertaken the implementation of the policy of Oromo extermination since 1992. The Amhara genocidal denialists are fully subscribed to this policy. In the Tigrayan regime’s jails millions of Oromo perished as the result of starvation, disease, the harsh environment, and physical extermination. We are the nation of heroes, heroines and victims. We were the victims of genocide yesterday and we are the victims of genocide today. Yesterday, we were victims of genocide under Amhara successive regimes and today, we are victims of genocide under the Tigrayan regime. Indeed, we are a wounded and bled nation in our country by another nation- the Abyssinian nation. We oftentimes say, never again to genocide in Oromiyaa. 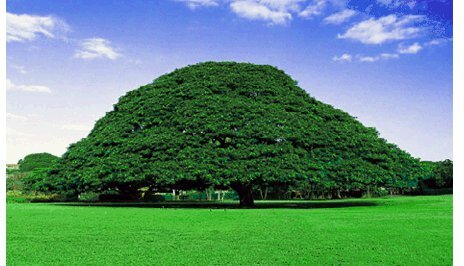 We say, the seeds of Aannolee, Azulee, and Chalanqoo must not be allowed to sprout again in Oromiyaa. And yet it has already sprout; violence is again around us; violence of genocide is still consuming our people. 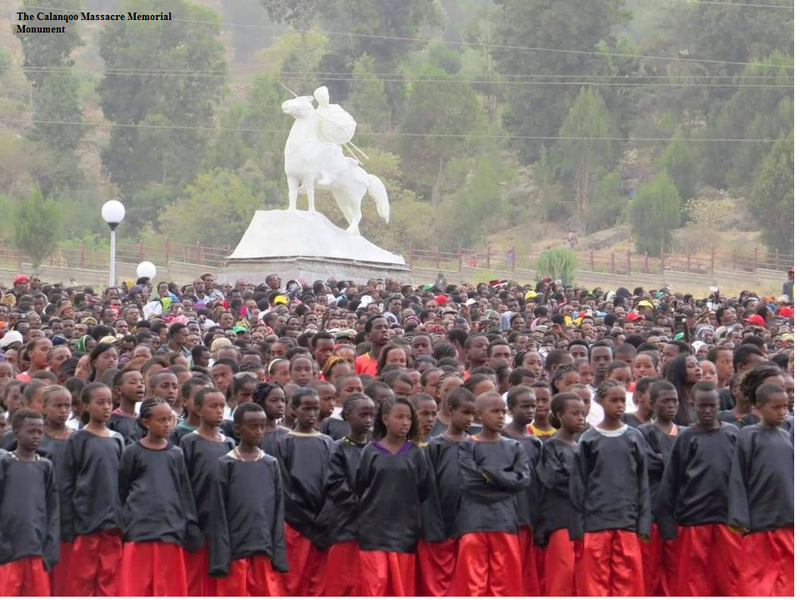 Menelik’s genocide at Aannolee, Azulee and Chalanqoo is reconstructed and renewed by Meles Zenawi and implemented Oromiyaa wide. Hence, the past genocide has now become the present new genocide. Hence, the dead Oromo are still dead; more are still dying; expropriated Oromoland is still expropriated; The pillaging of Oromiyaa is at its height and the colonized Oromiyaa is still colonized. The way forward is Oromo nationalists’ unity and the fight against occupation. For this, it is important to rebuild the Oromo Liberation Army (OLA) as superior mighty force both in quantity and quality to protect the population and secure liberation. This enables the nation to drive out the Tigrayan regime and establish independent Democratic Republic of Oromiyaa. 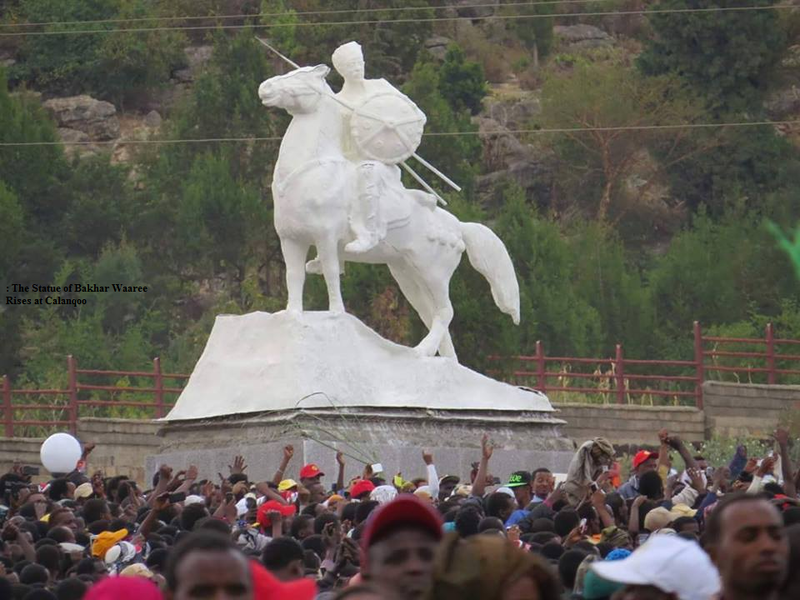 Again, it is vitally important to remove Menelik’s statue from Oromiyaa; establish National Genocide Memorial Day for the victims of Aannolee, Azulee and Chalanqoo. This Oromo Genocide Memorial Day should be established and observed annually while we are still fighting for independence. The date and the month must be different from Oromo Martyrs Day/Guyyaa Gootoota Oromoo. No one escapes from the history of one’s people. For this, we should and must not allow the past to rest and to be forgotten. Every generation must teach the succeeding generation about the past history, their heroes and heroines. The past, the present as well as the future belong to the succeeding generations. Each new generation hold the entitlement of the past and the present. For this, the establishment of the Oromo Genocide Memorial Day is the order of the day that the marks of Aannolee, Azulee, and Chalanqoo Cannot be erased from the memory of successive Oromo generations.